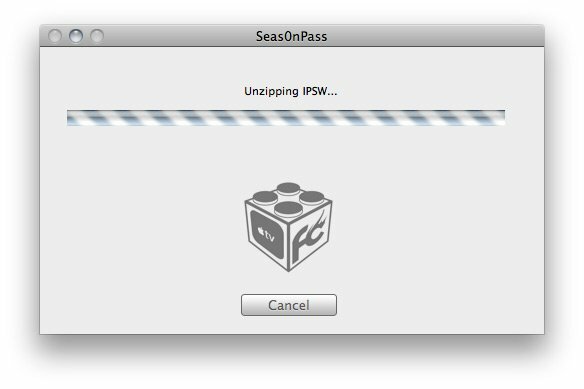 Seas0nPass is a new jailbreak tool designed by FireCore specifically and exclusively for the AppleTV 2 (no other iOS devices support).  This magic piece of software allows you to jailbreak your atv2 with the latest 4.1.1 (iOS 4.2.1) software by creating custom AppleTV IPSW files and restoring them in iTunes (similar to the existing Pwnage Tool app). It also includes a simple ‘tethered boot’ option which aids in using newer AppleTV firmwares when an ‘un-tethered’ jailbreak is not yet available. Seas0nPass is available for free, and is open source (the source code is available on Github). It’s Mac only (OSX 10.6 or later) for now but the Windows version should be released soon. 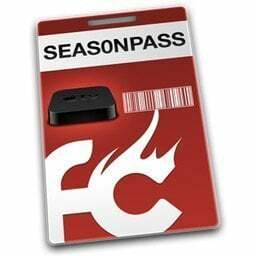 NOTE: users are experiencing many kinds of problems with jailbreaking using Seas0nPass. Read the comments on FireCore’s blog before you decide to try the software on your own device. Download and install the latest version of iTunes (check for updates through Software Update located in Apple menu). A micro USB cable will be required to complete the jailbreak. Step 1: Unzip the ‘Seas0nPass.zip’ file and launch Seas0nPass. Step 2: If your AppleTV is not yet jailbroken, select ‘Create IPSW’. (if already jailbroken, and you just need to do a ‘tethered boot’ scroll down). Step 3: The latest AppleTV software will be downloaded and used to create a custom ‘jailbroken’ software file. 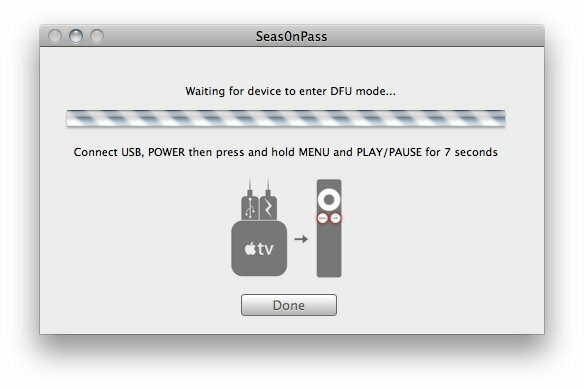 Step 4: When prompted, connect your AppleTV using a micro-USB cable (leave power disconnected), and hold both the ‘MENU’ and ‘PLAY/PAUSE’ buttons for 7 seven seconds. 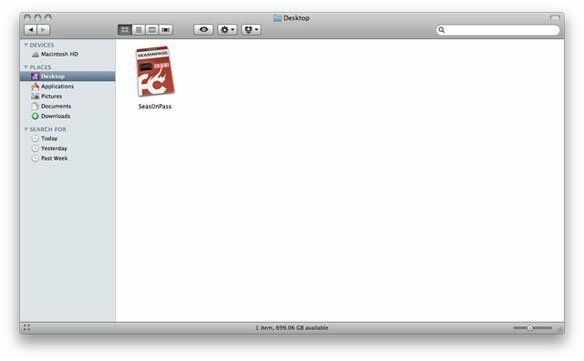 Step 5: iTunes will open automatically and start the restore process. 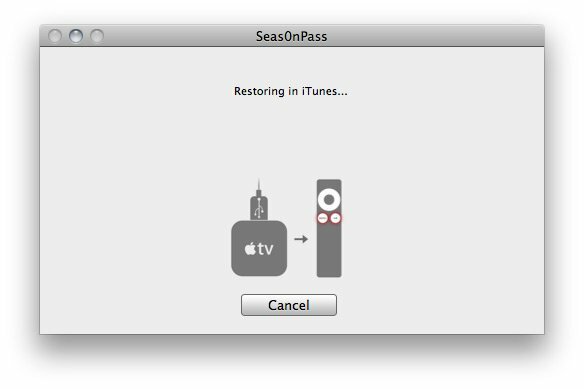 Step 6: iTunes will confirm the restore when complete – your AppleTV is now jailbroken. Please proceed to the ‘tethered boot’ section below. 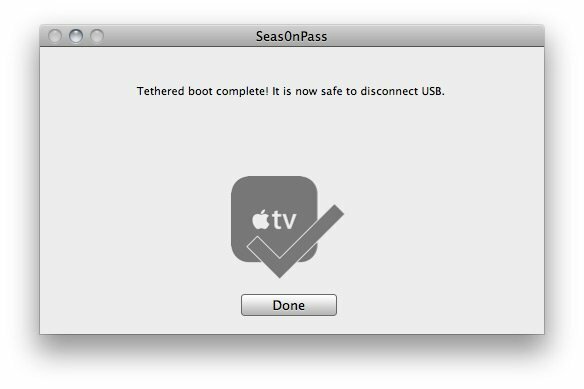 Some AppleTV software versions require a tethered boot. This means the AppleTV must be connected to a computer for a brief moment during startup. 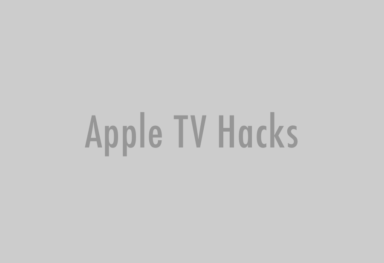 Note: The AppleTV MUST be disconnected from the computer (for at least a brief moment) after restoring in iTunes for the tethered boot process below to work properly. 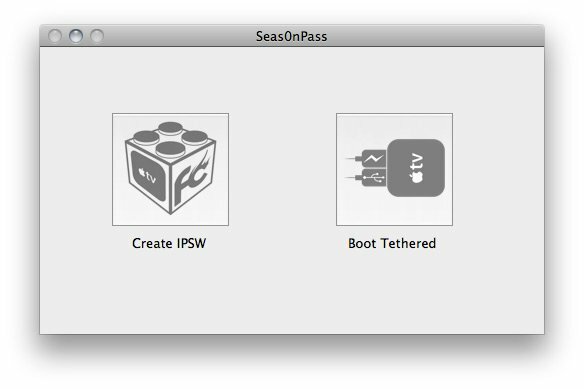 Step 1: Open Seas0nPass and select the ‘Boot Tethered’ option. Step 2: When prompted, connect the AppleTV to your computer via USB. Wait for the rapid flashing light then connect the power. Once both are connected hold both the ‘MENU’ and ‘PLAY/PAUSE’ buttons for 7 seven seconds. Step 3: Seas0n Pass will complete the tethered boot automatically. Once complete, remove the USB cable and connect the HDMI cable. 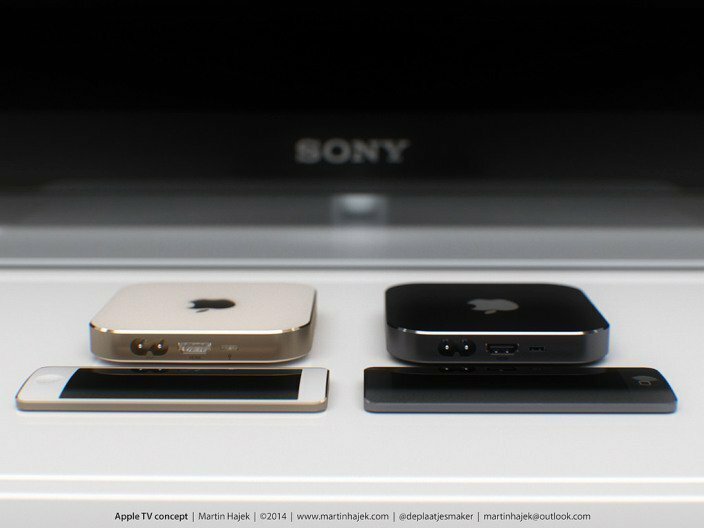 WWDC 2008 – what about Apple TV SDK?